Dave Hazard is a Student of Master Enoeda and also trained at the Japan Karate Association headquarters in TOKYO, He’s a professional instructor and teaches all over the country. 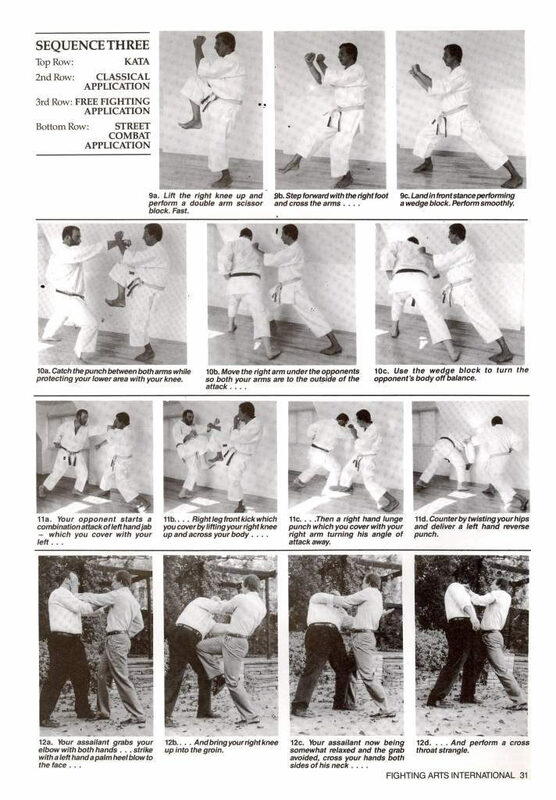 KATA, or formal exercise, is a set sequence of movements containing blocking, punching, striking and kicking techniques. These pre-arranged sequences are performed against one or more imaginary opponents attacking from ditfferent angles. THE above is a servicable text-book definition of Kata. 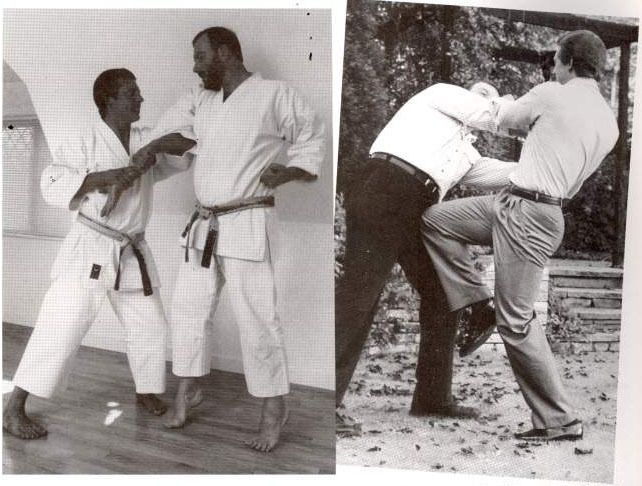 In fact the meaning of Kata is profound, for Kata is the living history of Karate-Do. It is our contact with the masters of the past, it represents their experiences, both in battle and in the ancestral training halls, providing us with an insight into the origins of our art. These moving text-books, performed with the correct rhythm and understanding, will enrich the mental and physical performance of the karate-ka and they will promote a balanced character and deep understanding of the art Of Karate-Do. As a practitioner of Shotokan Karate for the past twenty years and as a pro fessional Instructor for the last eight, it has been suggested by a number of my students that I write about Karate-Do. Without false modesty I have asked myself what have I to say that has not been said before and by those more qualified? There are, after all, a large amount of Martial Arts titles on the book shelve, the best of which seem only to repeat the well worn knowledge of the old Masters. So why add to the plethora of words? The answer is simple. No. I was not visited by some mystical Master from the past who, in my dreams, gave me some new and magical insight into an art whose fundamental secret is dedication and perseverance. 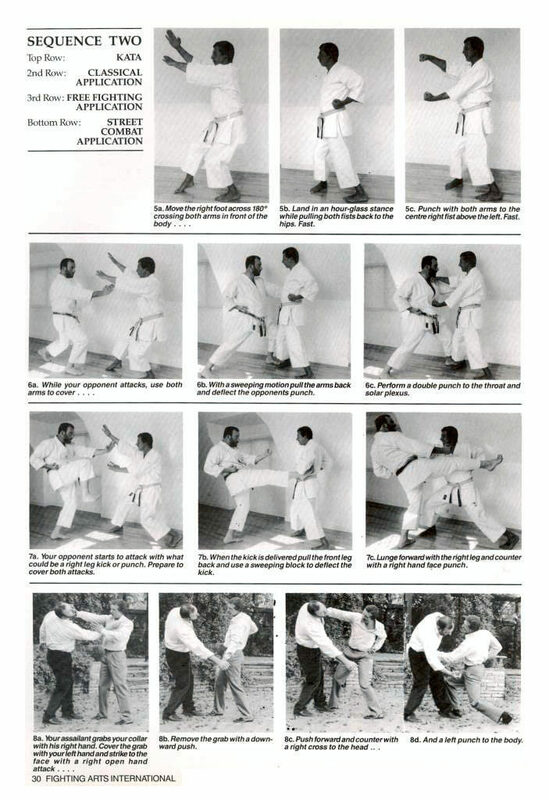 What has over the past years come to my attention, is that with all the text available on Karate-Do, I have been unable to find a single volume which covers, in depth, the practical application of Kata. Now to some extent understand this. There is a danger that the emphasis on application will overshadow the spiritual and mental attitude that must accompany the physical performance. To watch, for example, Sensei Keinosuke perform Kata, one tends to see through the slight physical imperfections of what could be a choreographed dance, and experience the sheer power of a Master truly living the moment. His spirit, mind and body are lorged into asingle unit. That unification is the essence of Karate-Do. 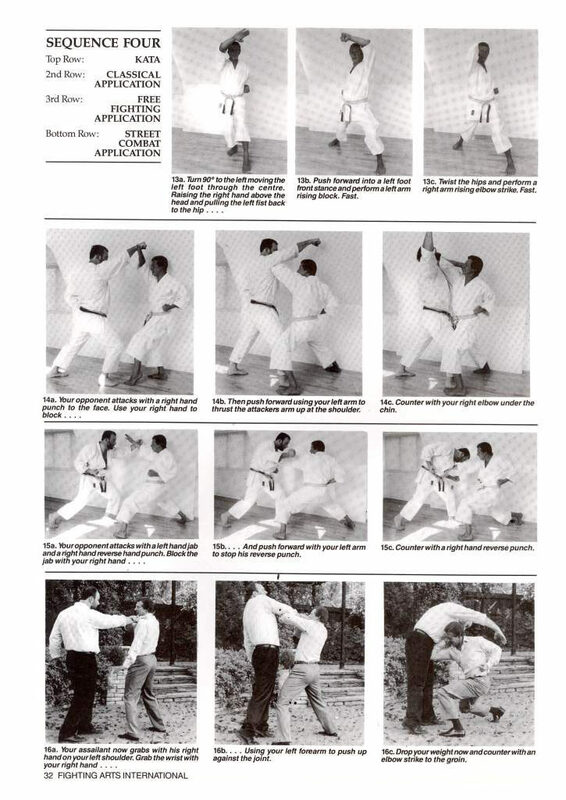 With this in mind, I ask the reader not to view this article, which is actualy the forerunner of a book on the subject, as a definitive on the performance of Kata, simply as an insight into one aspect, the practical application. understand through doing – and in no way are a criticism of my former instruction. Since that time with the introduction of Karate into the western culture, Sensei have come to realise that teaching application to the Kata is a valuable means of helping the student understand and remember the sequence of movements. l. The Kata as performed in movement – the choreography. 2. The classical application retaining as much ‘form’ as possible. 3. The Kumite or sparring application. 4. Combat or street application. performance retains the form ‘s movement, then the application is correct.